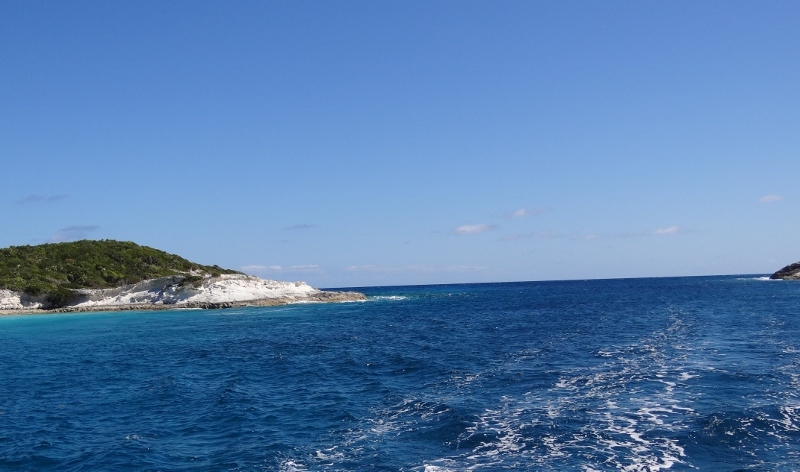 Bummed that we couldn’t learn more about the studies carried out at the Center (mostly by young interns from the looks of the photo org chart at HQ), off we sailed 16 nm north to Cave Cay. We’ve gotten used to irregular hours and days of business in the Bahamas, especially in what are mostly very low population areas. Two trolling lines out netted us zilch. Wind and waves pushed us along on a starboard tack at 7kts. Cave Cay cut is one of the best in the Exumas and even with the wind up we slid in nicely; with a little help from the incoming tide and wind. Nearly flat calm inside and pretty too, not like some cuts that make you nervous just looking at them. 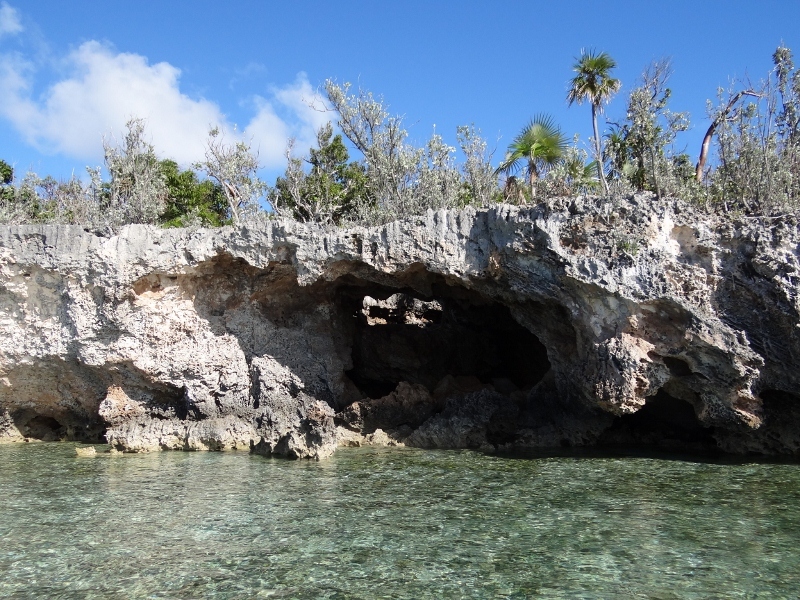 Hang a right once through the cut and you come to the mile and ½ long Cave Cay. 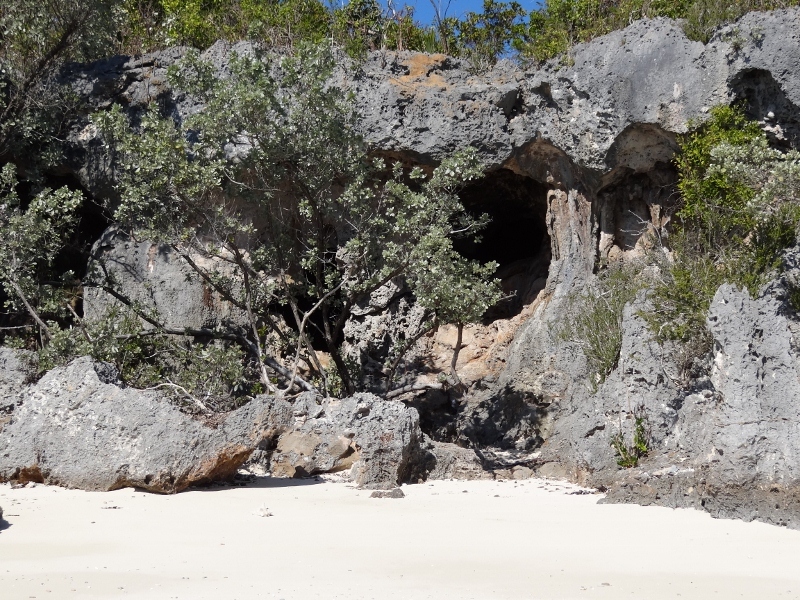 Cave Cay is privately owned and No Trespassing signs abound, but that doesn’t stop one from checking out the grotto and the numerous caves that line the south-western shore. A barely operational marina resides inside a much protected basin. Several new buildings and floating docks are enticing; except for one sport fish it was deserted. Good place to anchor though. The next cay just to the south of the cut is Musha Cay, supposedly owned by David Copperfield. Several colorfully painted, new looking buildings give the illusion of occupancy but again we saw no obvious sign of activity. Galliot Cut is just above Cay Cay with Little Galliot Cay about one mile in (west) from the cut. It was the next stop on our dinghy tour of the area. 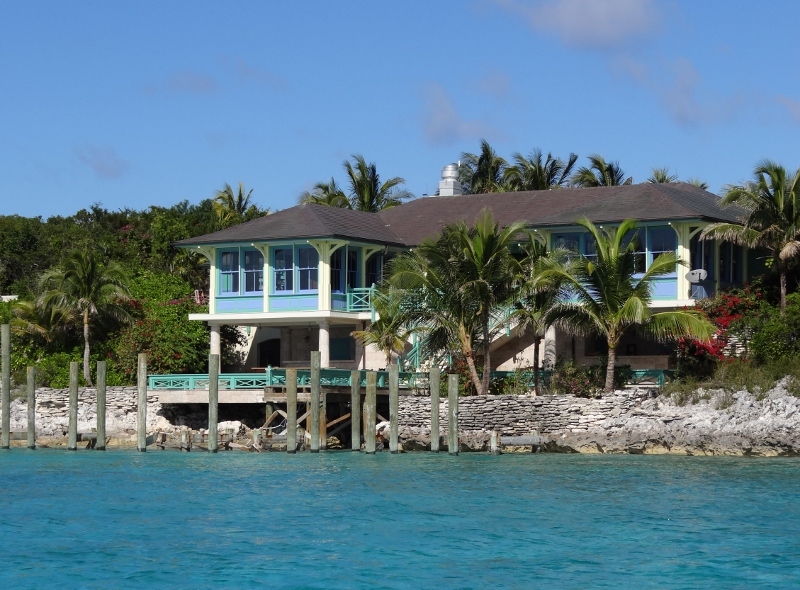 A tiny cay, 3/10 mile long, it was loaded with photo opps but no place to land the dinghy. More caves and a natural stone bridge or two kept me busy. We’re definitely enjoying this leisurely trip back up the chain. 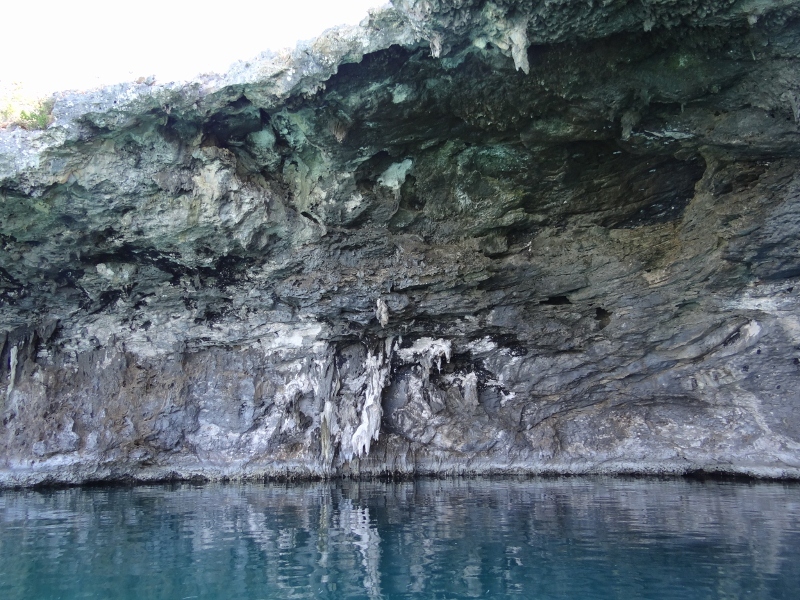 The cut (allows passage between the deep waters of Exuma Sound and the shallower waters of Exuma Banks- some are safer than others) at Cave Cay will be our last cut until we leave the Exumas as from here on up we can travel the bank side- calmer, prettier and offers more protection from the prevailing E and SE winds.